Interactivity brings a new dimension to your event booth. Touch screen presentations are exploratory and unique to each user. They’re engaging and a draw. They can provide user insights and data collection. And most importantly, they can be designed however you want to meet your specific goals. Product exploration – Allow users to explore your products and services on their own, interacting with content they find of interest. Designing a simple, intuitive interface encourages user engagement to find videos, animations, testimonials, product features and spec sheets that piques their interest. Games – Interactive gaming is a great way to not only attract users, but to have them engage with your products and brand in a fun manner. Typical games include: memory games, puzzles, match games, knowledge quizzes and even team play. Sales presentation – Equip your salespeople with an interactive sales presentation to provide a helpful tool to guide a customer conversation. Provide easy access to all your product information in this digital catalog so your personnel can quickly navigate to relevant literature, videos, forms or other sales aides. Product configurators – Offer your customers the ability to customize your products or services on a touch screen presentation. People like the ability to build and change in real time and see the actual results on screen. Built in share features allow for data collection and documentation of the experience while ordering systems can increase sales. Event registration – Interactive kiosks that allow visitors to sign up for or sign in to events can streamline the registration process and also provide valuable user data. User survey – A survey kiosk is a great way to receive feedback on your event and the products and services that were showcased. It’s also a valuable data collection tool. Offering prize drawings encourages participation. Social media aggregator – A social media aggregator allows visitors to interact and participate in your booth experience. The ever changing animation of user contributed content can be displayed on a large monitor or projected onto the ceiling or wall. This type of interactive is a great way to increase your social media presence. 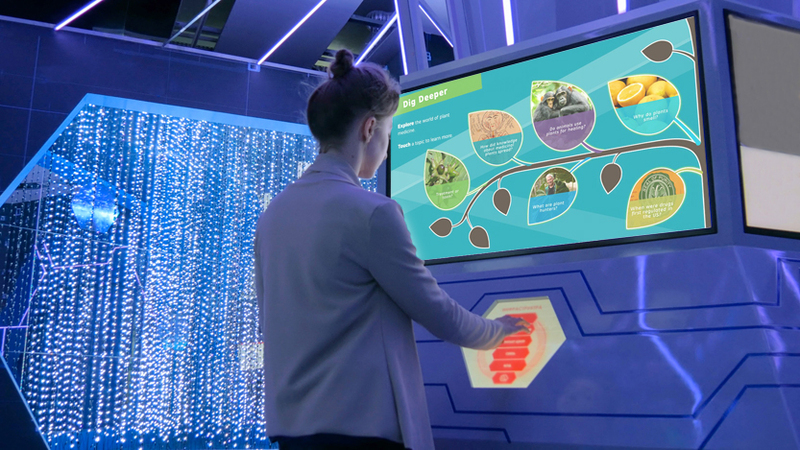 Competitive events – Touch screen applications can be built to guide or enhance competitive events such as an escape room, team play or live game show. Interactive mirror – An interactive mirror is an engaging activity that allows users to place themselves into different scenes or photographic backgrounds of their choice. Adding social sharing capability enhances the experience and increases brand awareness. Timelines – Interactive timelines can be an engaging method for visitors to learn about your company or product development milestones. Interactive maps – Interactive maps and wayfinding are a great aid for people to not only find out directions, but to be able to discover relevant information about key locations.